On Thursday my mom picked me up from school and we went to Mrs. Wallace’s house so we could practice my solo, Go Tell Aunt Rhody, and duet, Allegro, for District Music Festival. Mrs. Wallace has a cat named Ian which is funny because I have a friend named Ian. After that we went out to talk to Mr. Venier my Ag. Ed. teacher. He said I was doing well in Ag. Ed. We took pictures together and we showed my mom the greenhouse with my tomato plants and all the pretty flowers we have been growing. As we were saying `goodbye’ we heard the pigs squealing so we went over to see what was happening: yes! They were squealing really loud! It was crazy: one of the guys would grab a pig and hold him to get a tag put in his ear—squealing; and then some green paint in the other ear with another clip—more squealing. Ohhhhh they were not happy! It was called the hog weigh-in. They were not cute little piglets anymore but hogs and and wow could they squeal! It was loud! It was fun to watch. Then we checked on the goats and the chickens: Lucas still has my chicks at his house because it has been so cold but the other bigger chickens were doing fine. My Ag. Ed. tomato project. The pig gets a tag. At home we quickly changed our clothes and headed to the Dana Gallery for the Aerie International Reading. It was fun! I saw lot of Creative Writing friends. They had some very fancy food—fancy chips with dip, little pastries, little kabobs, and some fancy rice too. Then we listened to friends from Big Sky read some poems and other people read some of their poems. Then we took a break and they served some fancy ice cream and lots of different kinds of cookies. I took a little ice-cream and one chocolate coconut cookie. It was good—a little messy on my mouth; my mom kept motioning for me to wipe my face. It was good and well worth the effort. I saw lots of friends from Big Sky and I saw Jessica from The Writing Center. We listened to poetry and looked at the nice paintings in the Gallery. I got a three-word poem: a periwinkle butterfly on a canoe. It was nice. I like poetry. Then we had to leave because tt was early to bed for me because of Festival the next day. Friday morning I got up early and put my pretty dress back on and then we went to Hellgate. David was already there waiting for us. We were on time! I played my solo, Go Tell Aunt Rhody, with Mrs. Wallace accompanying me; then David and I played Allegro with Mrs. Wallace accompanying us; then David and Mrs. Haarvig played Greensleeves together. t sounded really nice! Good job! I gave Mrs. Wallace, David, and the adjudicator a pot holder. Everyone said I did a great job. My violin teacher, Heidi, Mrs. Haarvig, Mrs. Wallace and the adjudicator all said that I sounded a lot stronger and better than last year. It was fun! And then we were off to the next thing: my mom said that we had no time to celebrate because of FFA but that we would go to the restaurant for supper to celebrate a my wonderful playing at Festival. So we hurried home, changed into Official Dress for FFA, and met friends at the Ag. Center. We were all going to use the day off from school to fundraise for our banquet. My mom was our taxi and our first stop was Ivy at DejaNu and of course, she supported us and bought an ad. 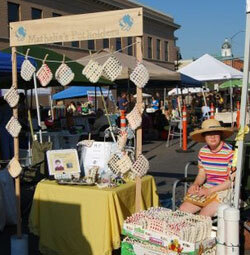 We went to lots of other businesses and had some success. It was fun to hang out with friends and work for FFA. We took a break at Costco and I ate a hotdog. It was delicious. Practicing my solo at Big Sky before Festival. Mrs. Haarvig encourages us the day before the competition. My solo at District Music Festival. Ivy buys an ad for FFA Banquet. Then my mom brought me home to change my clothes to work at The Writing Center. I called Gretchen to tell her that I would be a little late. My mom dropped me off so that I would not have to walk so far. When I arrived, I found Jake on MY computer! So I said, `excuse me, how long will you be?’ He said, `I have about 5-10 more minutes of work and then you can have the computer, Mathalia.’ So I picked up some WPA Exams to work on while I waited for the computer. My mom said that it is important to work while I am on the job—don’t sit around waiting but get to work; find something useful to do! So I did. After work, we went to the U-C to see our Art Fair friends. I did not sign up for the U-C Spring Art Fair because I am so very busy because this is my Senior Year but I wanted to say `Hi’ to all my friends. They said that they missed me and that some of my regular customers were asking about where I was. My regular spot was empty! Then my mom and dad took me out to eat at the restaurant to celebrate my fabulous District Festival playing on the violin. It was fun. I had a salad with curry noodles and a roll with butter. Then my dad and I went to the Library to see the movie Lincoln—-my mom went home to bed because she was tired and a little sick. The movie was so sad. There was war and fighting and at the end Lincoln was dead. It was so sad. On Saturday, there was no swimming so I stayed home all day long. My mom was very happy about this. We did laundry; I made pot holders; we worked on inventory on the computer; we wrote a blog post; and we listened to The Iliad. It was a very nice relaxing stay-at-home kind of a day. Well, she just posted a blog so I thought I could wish her a Happy Birthday. Oh. That is really nice but she is tired from Spring Break and needs to be fresh for school tomorrow. 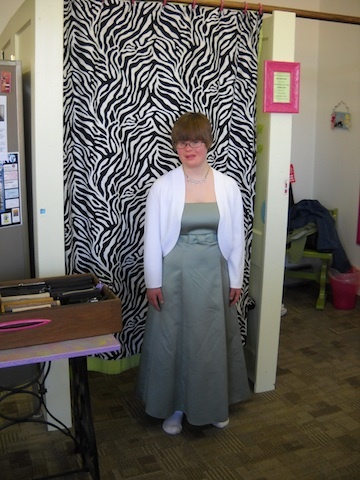 Can you wish her Happy Birthday at school tomorrow? May I ask who is calling, so I can tell her in the morning? This is crazy! Really? You are calling from China? Yup! I have lots of minutes that I need to use up. Yikes! I can’t even recognize the voice of my own daughter on the telephone! Of course, you can wish Mathalia a Happy Birthday! So that is how I got to talk to Morielle the night before my Birthday. She said that it was already my birthday in China. So she started the celebration early for me: `Happy Birthday, Mathalia! I wish I could celebrate with you! I will be eager to see your Birthday Blog Post.’ Silly mom! I almost missed being able to talk to my sister on my birthday. On Monday I continued to celebrated my 19th Birthday: My grandma and grandpa sent me an e-card which means that I watched it on the computer. I had time before the bus picked me up for school. At school with my friends I shared my Date-Nut Cake. And at home with my mom and dad we had a quick supper and very short and quick celebration because I had an FFA Meeting. I asked for Taco Salad and German Chocolate Cake. My mom was very happy about the Taco Salad—glad that I did not ask for something like homemade pizza! I wanted to open presents but there was no time but I did have time to read `Happy Birthday’ messages from friends on the computer. Thank you, friends! I quickly changed into Official Dress for FFA. I didn’t have time to write back because we had to rush off to the meeting; my mom got excited about seeing the baby chicks so we had to look at them and talk to friends about chickens. Finally, we got home and I was so tired that I went right to bed. Tuesday was a regular day except at Prudential I shared my Birthday Cake with friends there. And Gina and all my friends gave me a present: a lucky bamboo plant—it looks like a little bamboo tree and it makes me think of China where Morielle is living right now. It is easy to take care of: I just have to keep it well watered. I am excited! It is in a cute little pot with three little frogs holding the pot. I put it in the living room so we can all enjoy it. On Wednesday, at Special Olympics Soccer practice, the soccer ball hit me right in the face. It really startled me and sort of `stunned’ me as my mom said. I just wanted a hug and didn’t want to talk. My friend Kenzie told my mom that I got my picture taken as one of the `Inspiring Students’ at Big Sky High School that day. She was pretty excited and was `giving thanks’ about it. I was mostly `stunned ‘ by the soccer ball and I was pretty quiet in the car riding home—not telling my mom anything about my day—-so she suggested that we drop by the glasses shop to get my glasses adjusted. I felt a lot better after the technician fixed my glasses. After dinner, I went to violin lesson and practiced my pieces for District Music Festival on April 19th. I will play `Go Tell Aunt Rhody’ and maybe `Allegro’. Tuesday: Lucky Bamboo with Gina. Wednesday: feels better already. Thank you! Thursday I skipped taking the bus to school because we went to Murdoch’s to buy some baby chicks! We saw my friend Gabby’s mom and talked about chickens some more! Crazy! I chose 8 baby chicks; 2 Mericana’s; 2 Buff Orphington’s; 2 Barred Rocks; and 2 Polish . . . something, I forgot. They are cute–they have a little tuff on their heads. Grandpa and Uncle Jeff were at the FFA Farm when we got there—they wanted to see my baby chicks too. We painted their toes with green fingernail polish so that I will know which ones are mine. Lucas and Jamie were really nice showing us how to put the chickens in with the other ones so that they could make friends. We said `goodbye’ and I went off to Orchestra Class—I was a little late. Thursday evening Grandma and Grandpa and Uncle Jeff picked me up from swimming practice and we had Taco Salad and German Chocolate Cake again—this time I had more candles to blow out and presents! I got lots of cute clothes, a new puzzle and some money. It was fun! Eight chicks in the little box! I bought 8 baby chicks. USC Cinematic Arts t-shirt from Matthan! On Sunday after church, we went out to pet the baby chicks again. My mom thinks that they are growing already. She took some pictures and we will put them on my next blog. 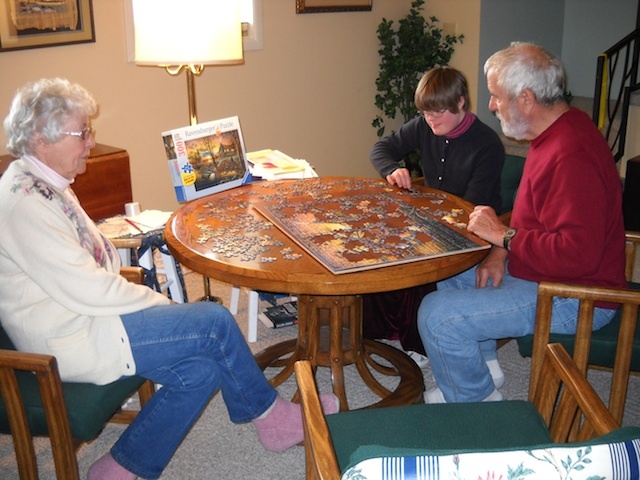 I took my new puzzle to Grandma and Grandpa’s house and we put it together. Grandpa thought it had a giraffe and alligator in the picture but really it was a stone chimney and a tree! Silly Grandpa. And, of course, Grandpa hid 2 puzzle pieces and of course I found them! So it was a very fun Birthday week: started on Sunday with a phone call from Morielle and it ended on the next Sunday doing my new puzzle at grandma and grandpa’s house. That’s a chimney not a giraffe! Monday morning! We got up at 6:00, ate breakfast, checked out of the hotel, and headed to Disneyland! I was so excited! I bought my own ticket and the ticket seller took my picture through the Mickey Mouse window and she gave me a button: Honorary Citizen of Disneyland. The first person we saw was Sleeping Beauty so we stopped to take a picture with her. She was very beautiful with a pretty smile and very nice. I buy my ticket. Welcome to Disneyland!
. . . and Disneyland! Two years ago when I went with my mom and dad and we had lots of fun but this time Uncle Jeff came a long too so things were a little different. He immediately wanted to go to Space Mountain: `Do you want to go to Space Mountain, Mathalia?’ he asked me. `Yes!’ Well, my mom was a little worried about that because I say `yes’ to just about everything AND because I had never been on a really scary, in-the-dark kind of roller coaster before but she said that it was okay to try, `We have pushed Mathalia her whole life, why hold her back from trying Space Mountain.’ So off we went to get in line. It was great! Uncle Jeff looked back at me at the end of the ride and I was smiling. After that we headed for The Matterhorn! I thought it was great having Uncle Jeff along this time. But I was a little disappointed because we did not have enough time to go to some of my favorite rides: Peter Pan, Pinocchio, Alice in Wonderland and Winnie-the-Pooh. But we did go to my all-time favorite: Snow White and I was wearing my MCT Snow White t-shirt so that was really fun. At lunch time we had another very fun Uncle Jeff experience: we were sitting on the New Orleans Square eating lunch out of our backpacks and Uncle Jeff noticed that an employee delivering bread had a little accident and four loaves of bread fell on the ground! He jumped right up and walked over to see if he could pick them up before anyone else. Nope! The employee picked them up and put them back on the cart. Uncle Jeff was disappointed but he was not finished yet. We kept eating and talking but he was watching those four loaves of bread. So when they were quietly thrown in the garbage can, he jumped back up again, walked over and retrieved them before someone dumped coke or something on them to make them soggy. He goes by the 5-second rule so they were still okay. For supper we bought some BBQ chicken and beef to eat with our fresh loaves of bread! Delicious! Successful bread rescue from the garbage can. BBQ supper with delicious bread. My favorite ride was Pirates of the Caribbean. I also liked Indiana Jones and Star Wars. We stayed until it was dark and we got to see Cinderella’s Castle with the pretty lights but we were all tired so we left before the light show and before the fireworks. It was a very fun day. I was just a little disappointed that I missed Peter Pan but my mom said that was because we had so much fun on the crazy more adult rides that we missed last time. Riding the pirate ship with Uncle Jeff. As we were putting gas in the car, we saw the pretty fireworks around the castle. It was fun. Then we got in the car and we drove and drove and drove and when I woke up, we were in Utah again! CRAZY. We ate breakfast at McDonalds and I had an ice-cream cone after I ate my Egg McMuffin. It’s great fun traveling with Uncle Jeff! We dropped him off at Salt Lake City Airport and he flew home to Phoenix. He can do that because he is a pilot. He doesn’t need a ticket, he just needs to get dropped off at any airport. Ice cream cone for breakfast! On the way home, I made 20 more pot holders, I listened to The Voyage of the Dawn Treader, and I looked out the window at the pretty scenery. I like to look for the `Welcome to Montana’ sign. It was late when we got home and I was tired but I made time to change all the calendars for my mom: we had left home in March and we returned in April. I started to unpack my stuff but my mom said that putting things away could wait until morning. It felt good to sleep in my own bed. Saturday. We ate breakfast at the hotel. I ate a healthy breakfast: eggs, sausage, whole wheat bread, oatmeal, cornflakes, raisin bran, water, and no juice. Then we drove to Matthan’s house to get Matthan. On the way to Hollywood I saw a huge violin! It was painted on a tall building, a skyscraper. My mom thought it might be an advertisement for Los Angeles Symphony Orchestra which reminded me of Missoula Symphony Orchestra concert is coming up in April. Anyway, we drove to Hollywood. We hiked up to the Hollywood sign. Well, we could not really hike to the sign like we can hike to the `M’ in Missoula. We could only hike around the sign: we walked around the back of it and saw the letters but we could not climb on the letters like we can climb on the `M’ on Mount Sentinel. Then we hiked around to the front of the sign so that we could take some pictures. Again, we could not get very close: Matthan said that he had tried to get closer when he had visited with a friend but a helicopter and seen them and shouted down to him and his friend to get out now! We saw lots of helicopters flying around so we decided to follow the `No Tresspassing’ signs. Silly Matthan for even trying! Spring Break visit to Matthan . . . Behind the Hollywood sign. Do you see Los Angeles skyscrapers? Los Angeles smog? Do you see the letter ‘H’? and the letter ‘O’? My hike ended at the `No Trespassing’ sign! We ate at the restaurant. I had salad and a waffle with fruit. Then we walked around Hollywood and I saw: Batman, Jack Sparrow, Spiderman, Princess Leah. It was funny. I also saw stars on the sidewalk and hand prints and foot prints. I did not think it was that big of a deal but it was very crowded with lots and lots of people around. We were tired so we decided to walk back to the car on a quiet, boring, Hollywood street. Before we went back to Matthan’s house, we went grocery shopping. My mom asked where the bathroom was and the employee said: `just follow the yellow brick road.’ And so we did! We saw the Wicked Witch of the West, Dorothy, the Tin Man, the Scarecrow and the Lion all on the way to the bathroom. It was funny! 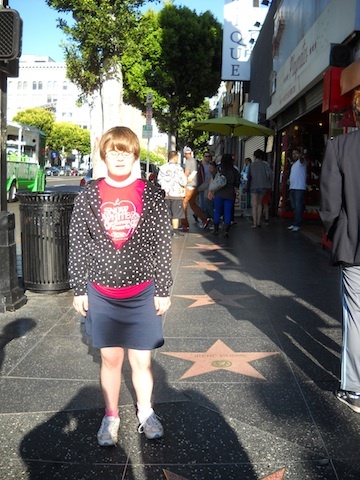 My mom said that we must still be in Hollywood for such a crazy way to get to the bathrooms! Sunday. We packed up the car and checked out of the hotel. Then we picked up Matthan and his friend Kyle and we all went to Matthan’s church for Easter Service. After church Matthan made us a big brunch with pancakes and Easter Egg Lasagna. It was delicious! Mom and dad brought Uncle Jeff from the airport and we hung out at Matthan’s house while he and my mom fixed the drain in the kitchen—it had gotten all clogged up with Easter eggshells. What a mess—-what a pretty mess because of all the pretty colors of the eggshells. It was raining so we decided to go to a movie instead of going to the beach. Last year my mom made us drive to the beach in the rain, park the car, run to the beach just to take a picture of me with Matthan at the beach. Crazy mom. This year she was reasonable and took us all to a movie that Matthan wanted to see, A Place Beyond the Pines. It was sad. We said `goodbye’ to Matthan and then we drove to Anaheim to be close to Disneyland for the next day. That’s all for tonight; tomorrow I will write about Disneyland. Hanging out at Matthan’s house. Last Wednesday—just one week ago we left for California to see Matthan and we are already back home. CRAZY!! I am very excited to write my blog posts about our trip. I took notes everyday so that I would remember what to write about. I have many things to tell you and we took lots of pictures! Wednesday last week. I went to school for one day after my Consumer Advisory Council Meeting. My mom picked me up from school because we had to go to an FFA Meeting about taking animals to the Fair in August. We learned about goats and we saw the baby chicks that Lucas and Jamie had in the classroom. My mom got all excited and started asking lots of questions which was CRAZY! I just wanted to get home, pack the car and go but she wanted to learn about how to take care of chickens. Silly mom. So finally, I just went out to the car to wait for her. And then when she was ready to go, she didn’t know where I was and she was looking all over for me—she should have known that I wanted to get going! At home I helped pack the car and then as we were driving down Arthur, I remembered: I forgot glasses case; I forgot retainer; I forgot toothbrush and toothpaste! So we turned around and I went in the house to get my stuff. My mom said it was good I remembered before we got too far away from home. I think going to school and FFA meeting, got me a little confused. Usually, I remember to pack everything I need. Anyway, in the car I started making pot holders and even after it got dark, I kept making pot holders until I had made an even 10 pot holders. Then I took a nap in the car and when I woke up we were still driving so I guess we skipped the part about the hotel. Thursday. I woke up and we were in Utah! 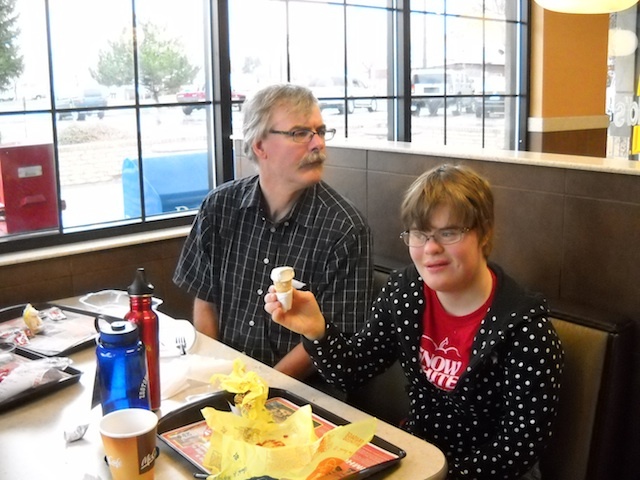 We ate breakfast at McDonalds in St. George. My mom and I brushed our teeth in the bathroom and combed our hair and then we felt ready to go again. I made more pot holders and I listened to The Voyage of the Dawn Treader. We skipped The Iliad which was fine with me. I think my mom read it all by herself in the back of the car. Then we were in Los Angeles! Wow that was quick! We picked Matthan up for dinner at the restaurant. We chose our own toppings for a pizza and they made it right there and then baked it very fast. It was good. After that we went to a party with Matthan’s Navigator friends. They were decorating eggs: I colored eggs: pink, orange, blue, and green; I put stickers on eggs; I put on a sticker with Matthan’s friends. I was still working on eggs when my mom and dad wanted to go to the hotel. They were tired from driving. I dye a blue egg. I hold the egg; Ally holds the blow dryer. USC Easter Egg Hunt in the dark. Friday. We went to the Modern Art Museum in Los Angeles. LACMA. We saw an exhibit on Stanley Kubrick. Because Matthan is studying film he was very excited about it. My mom said that the red chairs are very famous and that we should watch that movie sometime. She did not think that I had seen The Shining because it was too scary she said. I think I could handle it. I have seen lots of scary movies and I am very brave. 🙂 Anyway, we also saw some famous paintings: This is not a pipe; this is a picture of a pipe. Campbells Soup Can; some Rembrandt which was like pictures we had seen in The Netherlands this summer. We saw Metropolitan II which was lots of little cars going around and around sort of like the city of Los Angeles. I walked through very fun modern art. I saw the very famous red chairs from 2001 A Space Odyssey. Matthan is NOT smoking a pipe. I see the real Campbell’s Soup Can picture. We walked around campus and looked at USC School of Cinematic Arts. We saw lots of movie posters which was fun. Matthan made supper for us and then we went to Nav Night with Matthan’s friends: singing, Bible Study, and then hunting for Easter Eggs in the dark on USC Campus. I found five Easter eggs: I found eggs in a tree; I found eggs in the grass; I found eggs on the benches. It was not easy but I had help from Matthan—he had hidden them so he knew where to look! We went back to the hotel early because we were tired. That’s all for today! I am tired and I am headed for bed. I will continue my blog posts about Spring Break tomorrow or Friday.